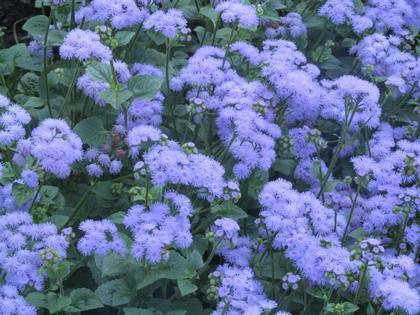 Recent ageratum cross breeding has led to this floriferous new selection. Similar in height and color to old favorite 'Blue Horizon', it has a mounded and slightly spreading plant habit as well as fuller flower heads, glossy narrow leaves and increased flowering along the side branches. Early and continuous bloom, solid butterfly appeal, and long vase life for cut stems (7-10 days) round out the appeal of this exciting new Ageratum.